It wouldn’t be an exaggeration to say I was excited about the Melbourne Business Practicum from the moment I clicked the “Apply” button. At first, the time spent in-company seemed more appealing than the on-campus Induction Week. The irony hit me on the first day of Induction Week, when the groups were formed. The project outline given to my team seemed very challenging, and I was anxious about working on a project with other students I had never met before. That’s when I understood the importance of the Induction Week to a student with no management background. The seminars dedicated to time management and how to assign tasks within a group were very useful to help us identify the path and the strategy for our project. The seminars also taught us how to deal with conflicts that may arise within a team during the project. By the end of the week I had become good friends with my teammates; we even selected common class streams for our next semester! 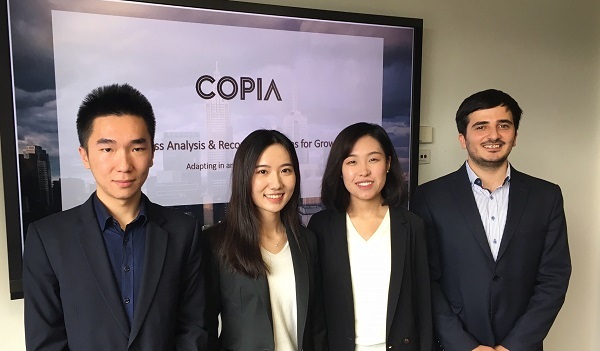 We were fortunate to be assigned to Copia Investment Partners, a third-party services provider for fund managers, which fit our background as finance students perfectly. The open project brief gave us a lot of flexibility. After our research proposal presentation at the end of Induction Week, our team felt confident about our strategy and the methodology that we would employ going forward. It was a productive Induction Week for all of us. I felt both excited and nervous on our first day at Copia. It was the first time I would be working in a real business environment. Our new supervisor was very friendly as he welcomed us to Copia and showed us our work place. He then briefly explained his expectations, and we realised that this was a very open project brief. There would be no direct supervision, no set tasks or templates; instead we would be free to follow our own instincts. We would also need to set up meetings ourselves with key people both inside and outside of the company to collect the information we needed. Despite my nerves I felt excited because this was such a valuable opportunity. A door had opened in front of us, with a whole new world for us to explore. There was so much to learn from a real life business operation. I also realised how important and powerful management consultants can be. Looking at the situation from a different perspective,bringing fresh ideas and solutions to a company - I saw that we could really help make a difference and contribute towards the future of this company. As a team of four finance students with limited marketing and management experience, it was initially challenging for us to get a clear sense of the project. During the first week in company, we used a significant portion of our time to determine the specific topics we would need to focus on, as there was so much flexibility with the project scope. We collaborated to evaluate our progress as we worked on our presentation slides and final report, making any adjustments when needed. Through this I realised that effective communication is really the key to productive teamwork and ultimate success. Another part of the experience that was both challenging and exciting was interviewing highly qualified professionals, especially fund managers.These professionals have very little time, so it was crucial that we asked precise questions to get as much valuable information as we could in a short timeframe. We needed to properly allocate our tasks to get the most out of the intensive in-company period, so we needed to utilise the time management skills we obtained throughout our studies. We were all eager but anxious for our final presentation to our client. Although we had put in a lot of effort on our presentation and rehearsed it many times, we were still worried about whether our recommendations would suit Copia’s needs. Also, we were told that four company directors would be attending, so we felt a little nervous about the questions these experts might ask. However, after our presentation they gave our team positive feedback; commenting that our presentation was ‘excellent’ and ‘outstanding’. It was especially rewarding to see that they enjoyed our presentation, and that our efforts were appreciated and met their expectations. We hope that our recommendations will give Copia some fresh ideas, deliver meaningful impacts, and ultimately make the company even more attractive to fund managers. Over the two weeks of the program I learnt how to work efficiently and effectively in a multicultural and dynamic team with people with different characteristics, personalities, backgrounds and strengths. I was also proud of how our group’s public speaking skills grew as the project progressed. The Melbourne Business Practicum provided much more than I expected; both in terms of enhancing my teamwork abilities, and in understanding my capacity to work in a real-world financial institution. The experience also taught me that if you put in enough effort and keep your mind open, you will learn a lot and, eventually, reach your goal.